There are many theories regarding the proper way to train a dog, with certain ideas having more credibility than others. 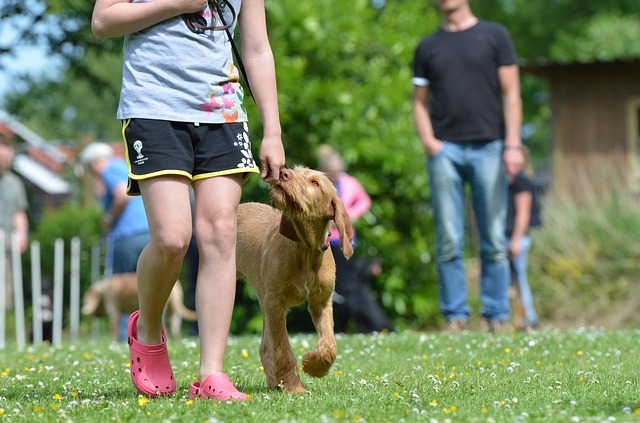 Here, a number of dog training myths will be discussed, as well as the corresponding facts. Myth #1: A dog that is slow-to-learn has an underlying behavioral problem. Fact: Dog owners who are struggling to teach their pet a command often blame factors such as dominance, stubbornness, or low intelligence on their dog’s deficiencies. Instead, owners should realize that dogs are individuals, just like humans. Most commonly, dogs that are slow to learn simply need to be communicated with in a different way. Other hindrances to training include lack of consistency, poor reward timing, and too high of expectations. Oftentimes, the problem simply needs to be addressed from the dog’s point of view, or for the command broken up into smaller steps. Finally, it is also important to consider the dog’s individual needs. For instance, a senior pet with arthritis might have difficulty sitting on command. Myth #2: Dogs look guilty when they have done something wrong. Myth #3: Puppies can’t be trained until 6 months of age. Fact: The answer to this myth depends on the type of training you intend to use. It is true that aversive techniques such as an electronic collar, choke chain, or prong collar generally should not be used on a dog until it is old enough to understand correction, as well as strong enough to withstand it. However, positive reinforcement training can begin from as early an age as possible. In fact, dog owners who do not begin training and socialization their pet early will experience setbacks. Myth #4: Positive reinforcement training does not work for all dogs. Fact: Some dog owners believe that positive reinforcement training is only useful for dogs with submissive, eager-to-please personalities. However, positive training can be used for all types of pets. In fact, positive reinforcement training is the most common method for “dangerous” animals, such as lions, tigers, bears, and whales. Animal behavioral research has even indicated that the use of aversive methods on aggressive, anxious, or fearful dogs can result in the worsening of these behaviors, whereas positive reinforcement training improves a dog’s confidence, as well as strengthens the dog / owner bond. Myth #5: Dogs display bad behaviors to show dominance. Fact: Dog owners are often mistakenly led to believe that behaviors such as leash pulling, jumping on the bed, or any form of bad behavior is due to the animal attempting to assert dominance over its owner. In reality, dogs display bad behaviors because they have been rewarded, either consciously or subconsciously. For instance, a dog that jumps on humans has learned that this behavior is okay, either via petting or attention (good or bad). Dogs that sleep on bed pillows simply do so because it is more comfortable than the floor. Instead of assuming that your dog is plotting ways to assert power dynamics, consider what reward your dog has received from the bad behavior, and seek to eliminate it. Myth #6: Food rewards create bad habits. Fact: Some dog trainers believe that food can create more problems than they solve. For instance, the use of high value rewards, such as cheese or hot dogs, is sometimes discouraged because of the mistaken belief that the dog will beg at the dinner table. Others liken food rewards to bribery for good behavior, while some owners worry that their dogs will only behave when they have a treat in hand. With proper use of treats, none of these scenarios are true. An animal will only beg if it is accustomed to receiving something for nothing. On the other hand, your dog is more likely to sit patiently and quietly if accustomed to being rewarded for good behavior. Additionally, treats are not a form of “bribery” when training a dog. Instead, they provide the necessary motivation for a pet to continue a training session, the same as humans are motivated by their salaries to go to work. Finally, in order for dogs to perform a command without the promise of a treat, food rewards must be properly phased from training. Myth #7: My dog should be eager to please me, and not care about reward. Fact: Each dog has its own individual personality. While some dogs do have an overwhelming desire to please their owners, all dogs ultimately make decisions based on what is in their best interest. This myth is dangerous because it can lead dog owners to believe that reward or reinforcement is not necessary. However, training a dog without proper reinforcement can result in an animal that is difficult to train. Myth #8: Old dogs can’t learn new tricks. Fact: Dogs of all ages can be trained. In many ways, training older dogs is easier than training puppies, as they tend to have a longer attention span and are more adept at communicating with humans. However, reversing an older dog’s bad behaviors does require additional patience, but can ultimately be achieved. Fact: If you have ever returned home to find that your dog has urinated on your bed, it can be tempting to assume that your pet was mad at you and retaliated for leaving him or her home alone. While dogs are intelligent animals, they do not plot complex acts, such as revenge. Instead, you should consider that your dog has an underlying medical condition; is displaying signs of separation anxiety; was left home alone too long without a potty break; or is not completely housetrained. Myth #10: Dog owners should never play tug of war with their pets. Fact: Tug of war, like any game that is played with a pet, is beneficial so long as the proper rules are followed. Never allow your dog to be mouthy and bite at your hands or arms. Your dog should also know the “drop it” command, and should always respect when you decide that playtime is over. Only when these rules are not followed is tug of war (or any other game) detrimental to a dog’s behavioral training. Fact: Since dogs are descended from wolves, some dog owners and dog trainers believe that canines should be trained using wolf pack theories. However, dogs have evolved to the point that there are significant differences between dog and wolf behavior. Instead, positive reinforcement training that ignores dominance theory is recommended. It always recommend that if you are having problems that you feel are getting out of control that you consult the assistance of a professional dog trainer for assistance. Allot of times it is just a simple change in habit that is needed.